Alas, the days of gastronomic innocence – when biscuits, Smarties and iced fairy cakes neither crossed your child’s mind nor passed for lips – are gone and gone for good. Of course, you could protect her nutrition virtue by locking her up in an ivory tower stocked only with healthy foods. But allow her to live in the real world – among the diet-sabotaging influences of peers, television commercials and gimmicky food packaging – and temptation will never be far away, ever beckoning her to stray from the whole-grain and sucrose-free. Make home a nutritional haven. You may not always be able to oversee your child’s eating habit when she’s out, but you can when she’s at home. 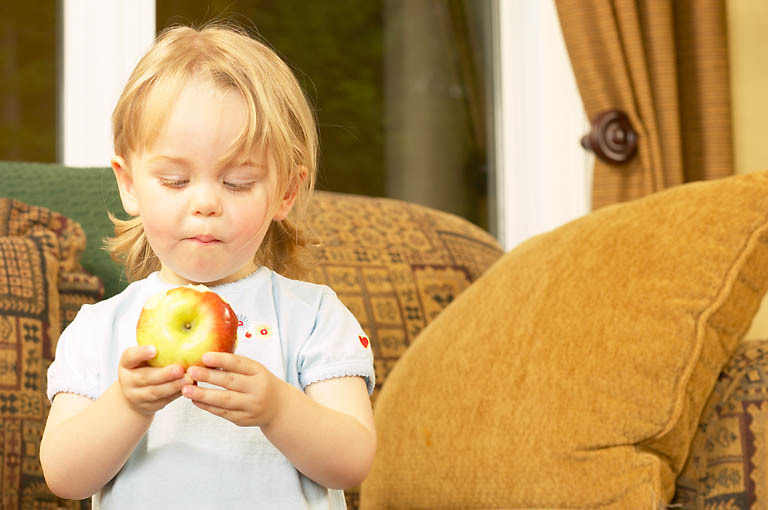 By keeping your home true to the Toddler Diet tradition, free – or mostly free – of foods made with white flour, excess fat, sugar and artificial colors, chemicals and other nutritionally unworthy ingredients, your toddler will have no choice but to eat right. Make eating well tempting. If your answer to sweets and crisp is carrot sticks, your toddler will come to associate good nutrition with taste-bud tedium. Respond instead with treats that are both nutritious and delicious, such as those beginning. A toddler whose taste buds haven’t been tainted will find them every bit as appealing as the more traditional, empty-calorie treats. Make your wishes known. Anyone who will be supervising your toddler’s eating when you’re not around – her teachers, nanny, playmates’ parents, grandparents, or other relatives – should be made aware of your dietary dictums. That doesn’t mean your toddler should be denied a birthday cupcake when all the other kids at day care are having one. But it does mean that her teacher should know that you prefer that your toddler not be offered junk food regularly, and that the rare exception not be overdone. Make a pact. The biggest stumbling blocks in the way of keeping a toddler’s eating habits healthy often are the eating habits of peers. Many parents find that making a pact with the parents of their children’s friends to avoid junk food at play dates, lunches, snack times, and so on, and to limit it parties makes it easier for everyone to keep their children’s diet healthy. It also eliminates the common parental plaint, ‘What can I do … all the kids eat that junk’. Make exceptions. The puritanical approach may yield your toddler’s compliance when she’s with you, but may encourage her defiance when she’s not. Allowing the occasional treat will help satisfy her curiosity and her cravings without undermining her nutritional profile.